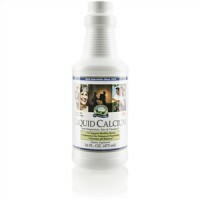 Provides nutrients that support the structural system,especially the bones, muscles, ligaments, tendons and skin. Supports the body's efforts in maintaining a balanced pH. Provides 25-30% of the Daily Value of vitamin D, calcium and magnesium per serving. 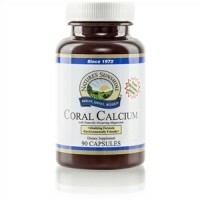 This formula provides important amounts of three essential minerals plus calcium. Combined with other trace minerals needed by the body, calcium helps replenish bone tissue that is constantly being replaced. It is needed by the immune system and is critical to muscle contractions. Calcium comprises half of all the minerals in the body. Calcium and magnesium work together in the body to maintain bone structure and integrity. 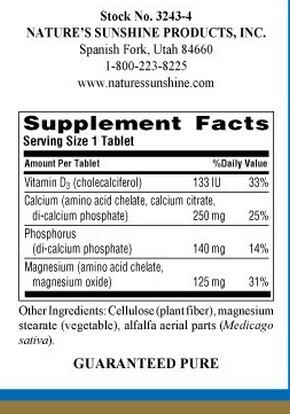 Magnesium is present in a 1:2 ratio with calcium. Without this important ratio, the body begins to lose one or more minerals before it can utilize them. 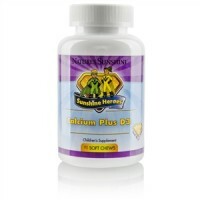 Vitamin D is needed for the proper dietary absorption of calcium. It helps calcium do its job. At least 400 IU of vitamin D is needed on a daily basis, especially for people not getting enough sunshine (D is the “sunshine vitamin”). Phosphorus is the second most abundant mineral in the body. It works with calcium. 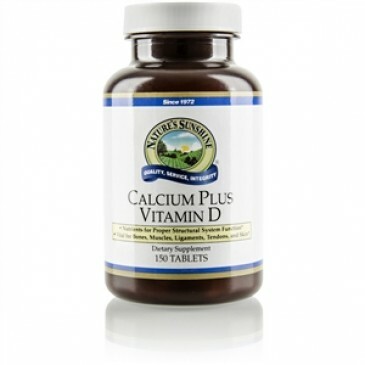 This formulation provides calcium and phosphorus at a 2:1 ratio. Phosphorus works synergistically with B vitamins to help maintain a proper fluid balance in the body. Eighty-five percent of the phosphorus found in the body is found in the bone. 133 IU vitamin D3 (30% Daily Value), 250 mg calcium (25% DV), 140 mg phosphorus (10% DV), 125 magnesium (30% DV) and alfalfa aerial parts.